Greatest Star Wars board game ever made. The object of the game is to battle and defeat your opponent. This game allows players to play out classic scenarios that all Star Wars fans dream about: Who is the greatest warrior of all time. This game allows this to manifest itself. As a player, you can pit almost any Star Wars character from any/all episodes versus almost any other (Darth Vader vs. Annikan). Two two-sided game boards allow for even more diversity (4 battle venues). 31 plastic deco'd pawns to choose your battles from. 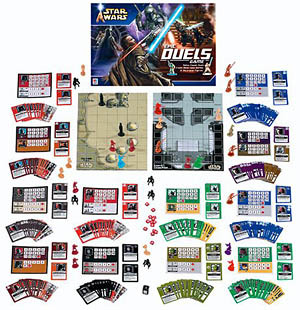 The Star Wars Epic Duels game allows fans to pit almost any Star Wars character against another. Gameplay takes place on one of four battle venues and players choose their character from one of 30-plus painted figures. Each character comes with its own card deck and strategy.